Raynor: A Supplier of "Meat," "Milk," "Fish," and "Provisions." As a child some of us feel that we are, at least for the short span of our childhoods, peripheral. We see but are not seen by the adults that pass. Some of us preferred that. That was largely my feeling as I spent those early years making mental notes of the characters that peopled a real and imagined Warwick for me, and that is depicted here. I say real and imagined because I am acutely aware that my recollections are largely the product of a romantic sensibility to these surroundings that are not shared by all; in fact, many have tried to offer up to me what they have deemed a more accurate view of Warwick. This was largely comprised of the Warwick that I choose not to remember. 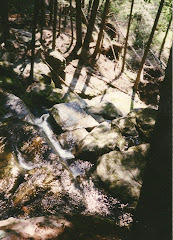 There are no absolute objective realities regarding what a place is; place is purely subjective. Warwick is and was a place of many different and sometimes conflicting realities. This is simply what I remember seeing and how I came to see it. The Raynor Store on Main Street in the downtown has likely slipped from people’s memories much as the numerous and forever changing names and businesses that have identified the village’s storefronts over the years. I haven’t looked to see whether the signs of this particular store have been removed during my often rushed and infrequent visits to the downtown in the last twenty years, but the last time I remember walking by the store’s front windows many years ago I was struck by the sun-bleached Kellogg’s cereal boxes. There were very few items visible on the shelves of the store then. This state had been long standing, for the door to that store was rarely unlocked and its opening and closing on a regular basis had long since passed. The large majority of my memories of this particular address are linked with the long standing proprietor Billy Raynor, as he was affectionately known to many villagers and those who lived just beyond its borders. 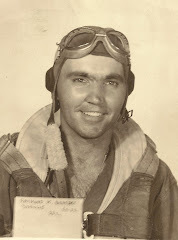 I can still see him standing at the back of his rusted grey 1959 Dodge panel truck loading it with boxes of groceries for one or several of his loyal patrons who greatly appreciated the grocery delivery he kept alive for many years after the store itself was seemingly closed to the public. That old grey truck amazingly functioned long after one thought it was near death. Its rusted hulk sat for passersby parked out at the Raynor Farm even long after Billy retired it for a Ford pick-up truck. 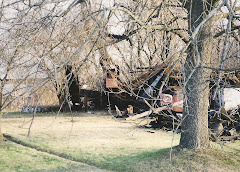 There it stood with its side panels on the verge of collapsing under the weight of its roof. 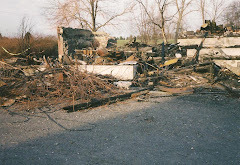 The nearby equipment shed and the main barn at the Raynor Farm itself were in a similar state of decay. 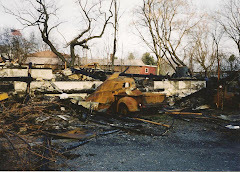 Everything that once defined the Raynor Farm, including the grey panel truck and Billy himself, has disappeared from the landscape in the past decade or so. He contributed much to the small town flavor of Warwick for me, and I feel confident in saying for many others. I knew of him but he probably never recognized me, although I must have shared small talk with him a half a dozen times over the years. So there Billy would be loading his truck on Main Street with orders for mostly older folks for what many suspected were the dusty cans and goods still on hand at the store. For those in the know his supplier was more often the local supermarkets where he would buy things and then resell them to his customers. As a teenager I can recall him coming through the produce aisle of Lloyds Shopping Center where I worked afterschool and on weekends regularly. I had overheard references to this tall and lean man accompanied by such adjectives as “eccentric” and “odd” throughout the years, but I am not sure that he exuded any of those characteristics for me. He was just like everyone else passing through the store requesting this or that to be weighed and price marked on the bag containing them; I knew then that the stuff he was buying was likely for one of his own store’s customers. 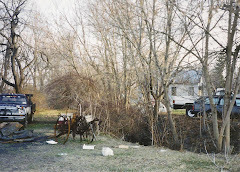 Earlier, before I had returned to Fair Meade Farm on Rt.94 to live, I had often noticed the grey truck and the tall thin man next to it in the village. The truck became a real icon of the world I knew then, and it was among those things that I would check periodically to see that they were still there to assure me that all was safe and routine like so many of us wished things to be during certain points of our life. By our teenage years we did everything in our power to openly avoid routine simply for the sake of being contrary to the adults in the room. The spooky, dilapidated mansion on the site now occupied by the Warwick Savings Bank on Oakland Avenue, the old jalopy on top of Spechts’s Garage, the clock at the Empire National Bank, the brown and white mechanical pony in front of Meduski’s, and the grey panel truck in front of Raynor's were among those favored things that I expected to see and give me that unexplainable sense of comfort I desired as I regularly travelled around in my hometown. The latter destination of this particular list of personal landmarks, which had originally been the Dr. G.F. Pitts Mansion, was likened to the Munsters’ house in the television series by my friends and I, and I regret to this day that we never got up enough nerve to climb in the house and explore it before it was razed to make way for the new bank. There were a number of other houses right in the village that were in the same degree of abandon and decrepitude that we did manage to sneak a peak at before the wrecking ball or the backhoe obliterated such obvious signs of the fragile local economy back in the early 70s. On the occasions of passing the Raynor Store in the early morning hours it was a likelihood that one could catch a glimpse of Billy Raynor ; he will forever remind me of the artist Norman Rockwell. Not for his art skills, but simply because I thought he looked like him. At the time, one of my aunts had given me a biography of this artist, and I was fascinated by his use of photography for his illustrations. For the longest time, I worked at imitating his choice of subject matter and style in doing my own small paintings of Warwick. Anyway, the resemblance to the artist struck me as convincing. There were a few occasions when I was privy to more animated observations of this guy. One of these had to do with my own passing fancy to play the banjo. As many know Billy was an accomplished player, and my father once sought him out for the possibility of getting me some lessons. The scheme never materialized, but I can remember my father talking with the older man about the possibility as I looked on. It was never my good fortune to hear the man himself play the banjo, but my father had and spoke very highly of him. For some reason still unknown to me, I took oil painting lessons with Mrs. Cohen in a back room of what was had once been Serpentini’s Jewelry Store instead of Banjo lessons out at Billy Raynor’s house off Rt.94. The newly launched art supply store “The Palette” had opened its doors sometime in 1977, and this was about the same time that I had my first job at the “five and dime.” I passed the Raynor’s Store regularly on my way by foot from our apartment on West Street to the five and dime for a few hours of work each week day during that summer. Ray Paisley, the owner of the five and dime at the time and a member of our church congregation, had offered me a job cleaning up and shelving goods while my classmate John Bonomi, who regularly held the job was on vacation with his family. 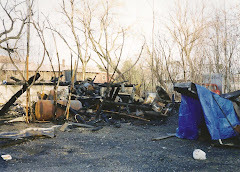 I am pretty sure that I never measured up to Mr. Paisley’s standards, but I had the greatest time cleaning out the former office of the Lehigh and Hudson Railroad that was located behind the five and dime on the other side of the Waywayanda in the nearest corner of the municipal parking lot. The simple wood building hovered above the pavement on wood posts. 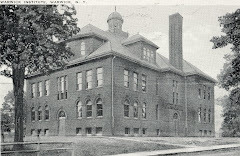 Mr. Paisley had purchased the building from the now defunct railroad for the purpose of extra storage. The building was a dusty mess, and I recall emerging during the few days it took me to clean it out covered from head to toe with dust. 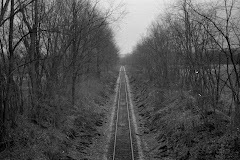 There were a lot of surviving papers from the railroad which Mr. Paisley had no want of, and I remember him emphasizing this fact once when he caught me sitting on the floor pouring over some ancient account books and receipts on his time. There were a couple dozen bound ledgers dating from the 1930s and 1940s among the stuff that was destined for the dumpster. The ledgers were embossed with the name of the railroad and the year. Inside were these highly detailed print illustrations of various types of train carriages: hoppers, flat, box, and baggage cars; one type of car every few pages. The illustrations had been done with metal plates as I recall because the surface on the page’s underside was raised from the pressing of the dense illustration onto the paper. The illustrations were what I saw as valuable. Below each of them were spaces for entering tonnage and materials being transported, but whoever was responsible for recording such information had either entered it someplace other than the ledgers or had simply neglected to do it. There were only a few pages that had numbers penned in. I went through every page of the ledgers, and I remember that I came across several sheets of business correspondence with the Lehigh and Hudson letterhead on them with dates that began “193_” and “194_.” At least one of the ledgers may have been from the 1920s. I was living with my parents and sister in a very small apartment at the time on West Street, and I had to make a decision about what I could get away with hauling home and saving and what would send the adults over the edge and respond with an ultimatum to get rid of it all. I saved some two dozen bound ledgers, which I can still hear my mother asking me about in response to their placement on the living room floor, “What are you going to do with those?” She wasn’t pleased, but she had learned to give into my collecting obsessions. I stored them under the cheap Danish Modern couch that I suffered as my bed for the year or so we lived there. 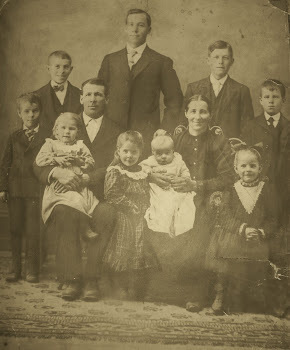 I eventually took the ledgers with me to the farm on Rt.94 when my mom, sister, and I moved back in 1978. 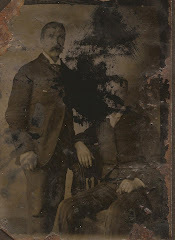 They stood in a stack at the edge of my bedroom until I moved away to college several years later. Upon my return almost ten years later, I learned that the contents of my room had been stored in a barn or had been sold at several yard sales through the years. What became of the ledgers no one remembered, so they are lost to me. 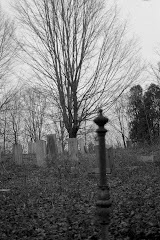 During the spring of 1978 I helped my grandmother to clean up the private graveyard that is located in the large field across from the main house of Fair Meade Farm. Such clean ups became routine about this time, and I liked the outdoor activity. The graveyard is reputed to have a little more than fifty burials in it, but only a small fraction of these have existing markers that are known and far fewer include some inscription. 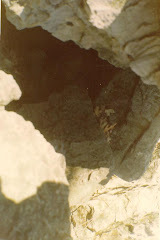 Among these there were two simple flat fieldstones with “JOHN BLAIN 1817” and “JAIN BLAIN 1816” primitively carved in them with inverted “N”s indicating the negligible schooling of their carver. 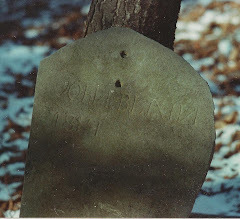 John was the son of Thomas Blain and the husband to “JAIN,” whose name here was likely a misspelling of Jane. 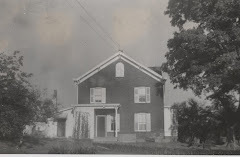 The original homesteader, Samuel, had purchased the farmland in the Waywayanda Patent and built the nucleus of the main farm house in the 1730s as well as the barn that remained standing until recently and had during my own time been referred to as the ell to the larger English style barn that had likely, given its size, been constructed sometime by the mid nineteenth century or shortly thereafter. 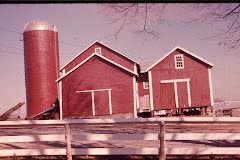 The larger barn was severely damaged in a hurricane in the 1980s and had completely collapsed by the end of the decade. The entirety of that barn was eventually removed. Fortunately, I photographed the gravestones of the Blains much to my grandmother’s wonderment. 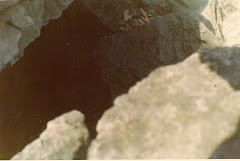 There is likely no other known photographs of them; the stones have mysteriously disappeared since then. There were other stones too, but one of the only stones that had obviously been created by a professional stone carver was one of red sandstone for “Elizabeth Ackerman.” This stone, if I remember correctly, dated from the 1850s. The “plot,” as we referred to it, grew up with saplings, vines, and just about everything that couldn’t get a foothold in the surrounding and annually tilled corn fields every spring; it was inpenetrable by the summer. There were some very large and gnarly white ash and other hardwoods in this grove in the midst of over a hundred acres of open fields. These trees sheltered the plot and lent to some very scary conditions at night, when I visited the graveyard on several occasions in high school while on my way to or from the Drive-In where I would sit and watch the movies for free until the snack bar finally closed after countless warnings and the screen went blank. On this first occasion of cleaning up the plot in many years, I was busy hacking away at the vines while my grandmother burned what would burn. There was a lot of smoke, and this obviously had caught the attention of Billy Raynor who was driving down Rt.94. He came onto the property, parked, and walked into the field where we were. The smoke, by the next morning, had provided me with the worst case in memory of my annual bouts with poison ivy. I had it in my throat, my eyes, and every place imaginable. Hours before all the scratching started, I remember Billy Raynor there sifting through the plot and stopping at the unmoored and belly up stone of Elizabeth Ackerman. He claimed she was an ancestor as were some of the others buried in the plot. 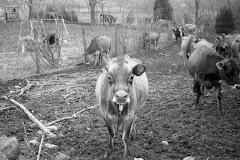 My grandmother held her tongue and said little at the time, but I recall that once Billy Raynor walked out of earshot back to his truck she expressed her anger at what she saw as an affront to her ownership. Something was probably said to the effect that “he thinks the Raynors still own the entirety of 94…” At this same time she informed me that my grandfather had wished to be buried in this graveyard like many of the previous owners of the farm had been, but that didn’t come to pass because there were ordinances by 1964 against such private burials. He was buried in the Warwick Cemetery instead. Years earlier I had regularly popped my head in Raynor’s Store to give a shout out to my uncle Aaron Hasbrouck. He was the butcher-in-residence at the store for many years. The thing was that Aaron had always worked for the Raynors and was, according to the stories I heard from the family, like an adopted son to old Mr. Raynor, Billy’s father. 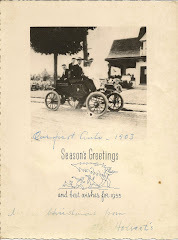 As a child he had come to live with the Raynors on Fair Meade Farm which they owned from the 1890s until 1943 when Hugo Neagle had bought it from them. 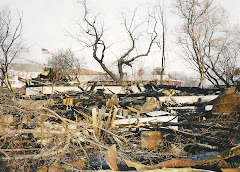 The main house , that was recently razed to make way for a Price Chopper, had been Aaron’s childhood home, and what served as the kitchen on the first floor up until recently, had been Aaron’s bedroom. The kitchen was still located in the kitchen then as it had been since colonial times. I remember often seeing Aaron with an apron on behind the counter of the Raynor’s store, and he would give a yell back in that gravely voice of his. He was very old school with his gray flat top and his plastic square frame glasses. He always wore a shirt and tie too. Although I can’t remember ever having much a conversation with him, he always seemed to exude a calmness that would fill the room. The period when I was old enough to walk down town and see Aaron at the store was very brief because he retired around this time. I may add that the Warwick Bakery, which was a door or two down from the store was a regular destination for my mom, sister, and I. My mom wasn’t much on baking or cooking, so we would usually get our birthday cakes and other sweets from this bakery downtown. We were all fans of their Napoleons and éclairs. The contraption that allowed the baker’s string to feed down to the unpainted well-worn wood countertop from the ceiling comes to mind as I transport myself back to that time. The dark haired woman with the dark eyeglass frames would skillfully box up purchases like a rodeo calf out of the gates in record time. Her name escapes me but she was there when I ventured to the bakery on my own with earned money in my pocket a few years later. By then cream puffs for 60 cents were my favored choice; they had generous amounts of whipped cream in them. Evidence of these solo purchases were long gone by the time I got home, and I believe that I probably never shared the fact that I was stopping there at least once a week during this time but Uncle Aaron surely knew at least until he retired. Long before these memories of the downtown were had by me, F.C. 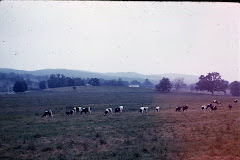 Raynor ran a dairy at Fair Meade Farm and bottled his own milk for delivery. 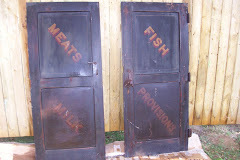 In addition to bottled milk, he delivered meat, fish , and provisions. I have collected both information and material culture from this early enterprise over the years. 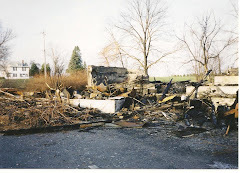 Recently, as I have mentioned, all the buildings of Fair Meade Farm, except the well house and a carriage barn on the opposite side of Rt.94, were destroyed and the debris completely removed. Some of the important architectural details from the main house that underwent a number of additions and renovations from the original 1730s structure which consisted of a ground floor with a kitchen hearth and root cellar and possibly a second story sleeping loft fortunately were removed and donated to the Warwick Historical Society. Among the outbuildings that was particularly important to F.C. Raynor’s bottled milk business was an ice house. 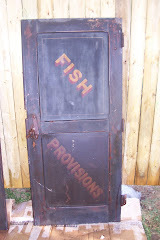 This building had been converted into an equipment storage shed by my grandfather sometime after 1947. The foundation had been reinforced and replaced in the front and back with concrete block. The centrally located vertical doors that were situated one on top of each other from the foundation to the roofline had been sealed. These had once allowed easy entrance and exit of ice cakes from the pond that remains largely silted in close to Frontier Lanes. Multiple layers of cakes had likely been stacked from the ice house floor to its roof studs at one time, and it is a good guess that ice entered through the northern end of the building and left by way of identical doors at the opposite end which was in proximity to a semi-subterranean milk house that had mortar and fieldstone walls topped by a slanting roof which also remained until recently. The interior of this was always damp and considerably colder than the temperature outside, and there was a shallow trough that once kept milk cans cool in it. Whether the milk house was the location where milk was bottled is not known. 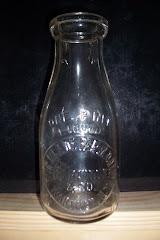 Bottles would likely have been washed in hot water on a regular basis before filling with the unpasteurized milk. The size of the milk house suggests that such production was completed someplace else. 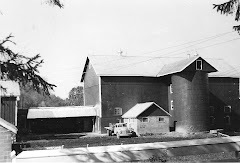 The adjacent overhang may have been configured differently in the past; there are no known photographs of the barnyard before the 1940s when my grandparents took ownership of the farm. 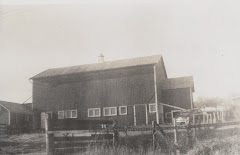 A new milk house was built by my grandfather to house the final destination of a modern pipeline for machine milking installed in the main cow barn in the 1950s. Two large stainless steel bulk tanks would eventually be housed in this cement block structure. 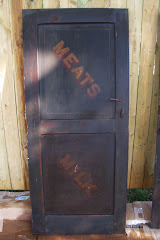 In addition to sealing the original ice house doors a sliding door on a steel track was installed on the northern end of the building by my grandfather. A large opening was made on the southern end large enough to drive a tractor into the space. 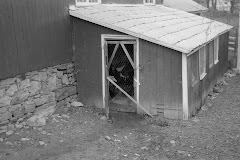 The floor of the former ice house remained earth in contrast to concrete surface of the barnyard just beyond its door’s sash. One of the obvious remaining features of the building’s prior use was its thick eastern and western walls. 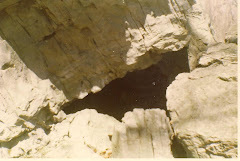 These were roughly 8 to 10 inches thick with vertical planking on the interior which held in sawdust insulation. No such planking or insulation remained on the northern and southern ends; these may have been entirely removed during my grandfather’s modifications. During my wanderings along the creek that runs down Moe Mountain through our farm, I discovered the remains of a dump which dates from at least the time the years of Raynor ownership, if not earlier. The most abundant visible debris extant is glass shards from the milk bottles used by the Raynors. The raised letters on the fragments from the fronts of these bottles read from about midway on the pint size “one pint liquid” before an oval emblem consisting of the words “Fair Meade Farm Dairy Warwick, N.Y.” around the perimeter, and “F.C. Raynor & Son” in the center. There was likely a more popular quart size of these, but I have never seen any other intact bottle except the pint size one which I discovered sitting on a shelf in the basement of the main house. 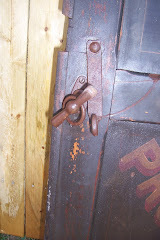 In addition to the milk bottle I discovered a pair of back doors to a horse-drawn panel wagon that was once used by F.C. Raynor for the delivery of “meat,” “milk,” “fish” and “provisions.” On each of the four panels that make up the two doors a grocery good is stated in professionally executed gold yellow letters with red highlights. A pin stripe in the same gold yellow also adds ornament to the black paint surface of each panel and the entirety of the doors. 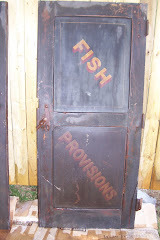 The doors each measure 22 inches wide and 36 inches tall. 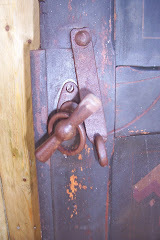 They were once locked in place on the wagon itself by turn handles that attach to vertical metal shaft mechanisms located on each of the doors on their inside edge. 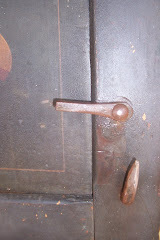 All the metal fixtures of the door appear to have been hand forged, and may have been made at a local wagon works and blacksmith like Jason McPeek whose blacksmith shop once stood at the south west corner of Smith and South Street in Warwick. 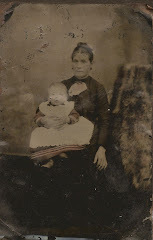 My great aunt remembers as a child in the 1930s going to that same blacksmith shop with her father to have farm machinery and tools repaired for his farm that was located in Little York. 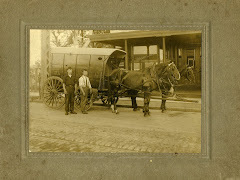 McPeek produced wagons and sleighs; I own a complete horse-drawn cutter that was manufactured by "Jas. 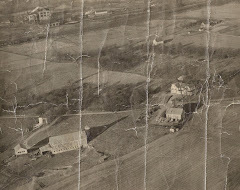 McPeek of Warwick, NY" sometime in the 1890s. This stood near the wagon doors when I discovered them under some hay and debris. They have no doubt been there since long before my grandfather purchased the farm. The milk bottle and the wagon doors are among the few things that remain from a time when most everyone knew the name Raynor as a producer and supplier of food staples for the villagers of Warwick. Orange County's Onion Harvest Festival started in 1939, and the photo at the right is of a float presumbably in a parade that was part of the celebration. The woman on the float at the right is my great aunt Lydia Hasbrouck (nee Kiel) who was a telephone operator for the Warwick Telephone Company for over 40 years. She started with the company in 1937 at age 21 at a rate of $1.00 per day. Her first check was for $44.00 for 44 days worked; Social Security was deducted from her subsequent checks at a rate of .01 cents per day. In 1957, she attained the position of chief operator. Until after World War II, when Texas became the leading grower of onions in the US, Orange County claimed itself "America's Onion Capital." 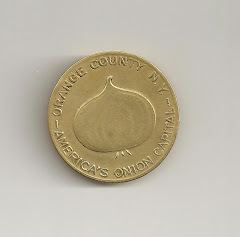 Another item included here is a brass token from the 1940 Orange County Onion Harvest Festival that was used as admission to this second of the annual celebrations. The late Eduard Peschel of Warwick, NY gave the brass token to me one day after he rediscovered it while cleaning out a drawer in his home desk in 1977. He related to me at the time that he had been an attendee. 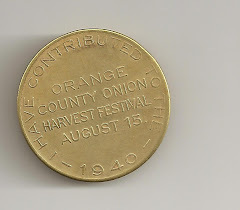 The token states "I have contributed to the Orange County Onion Harvest Festival August 15 1940" on the reverse. 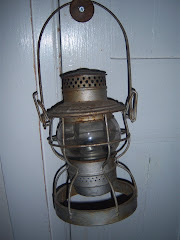 He knew how much I loved local history and often gave me such things when he came across them in the home he had lived in since his childhood at 10/12 West Street, and where, for a short time, I lived with my family in a small upstairs apartment. The “church green” in the center of the Village of Warwick was the center of my world during the years I spent living at 22 High Street (1973-1976). If I were there today and still 10 or 11, I would be sledding down the hill from a point not far from the three sets of steps to the Old School Baptist Church down to the bottom where the darkened cement wall still defines the green. 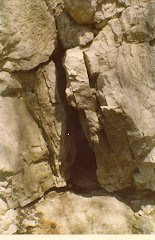 That cement wall really put a damper on the experience, for it ended a steep and speedy run abruptly; sometimes with a bruised knee or two. We, my sister and the neighboring kids on the block, shook off the mishaps and injuries rather than seek sympathy inside; we trudged up the hill a couple dozen more times with the same result, for fun supersedes all when your 10 or 11. We wanted to stay out until it was dark if we could, or, at least, until we were called for supper. That meant skipping lunch to forgo the hassle of getting in and out of a soaked thru snowmobile suit and face rebukes for tracking snow all over the house trying to get those goofy looking boots with the half broken clasps on them off. What engineering genius thought up those things? Snowmobile suits were all the rage as were the boots with the clasps during that time when I probably never saw a snowmobile much less rode one. The suits, one for me and one for my sister, had probably been the result of some bargain shopping at Playtogs in Middletown. There were other sled runs on the church green that we manicured after a snowfall. The snowfalls that were especially great were those punctuated with the three consecutive soundings multiplied by three from the roof of the Excelsior Hose Company at the end of the street. I wonder if that sound is still bringing smiles to kids' faces lying in bed like it did for me on a schoolday? The soundings signified a snow day, a day of uninterrupted play; we prayed for those days. There was a slope on the side of the church that stretched down diagonally to some lilac bushes and a Catalpa Tree at the back of Lewis Park, but that was slower by comparison than the front of the church. Speed was optimum. At the back of the church facing Church Street was the steepest hill of all, but that run ended with the extremely dangerous situation of going over the concrete wall, dropping thirty inches, and crashing down onto the blacktop. In-town traffic was minimal back then, and if someone watched out for cars it was worth the risk and the danger of jumping the wall and going out into the street, cars or not. I tried it once or twice, and wisely decided to forgo injury by keeping to the front of the church. That is not to suggest that we weren’t usually out in the street, and people simply took it in stride and drove slowly. I never remember anyone yelling at us for doing so. We were a good respectful bunch most of the time. There were the occasions of walnut fights that fanned out into people’s front yards, and you might see a scornful eye or two in the windows of our neighbors but it was quite awhile before anybody talked to us about the inevitability of a broken window or a serious injury. 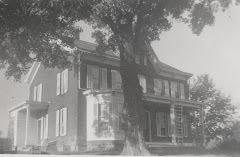 The large walnut tree was on the fence line between Mr. Gove’s property on Church Street and the back of the church property. The walnuts with their green noxious coverings spilled out onto to the street and church lawn every fall. Cars would run over them and send them flying in every direction. I don’t know who it was that first picked one up and threw it, but things were never the same after that. The kids on High Street had to cut across the church green to and from the school bus stop that was at the corner of Forester and Church, so we all passed the temptation of those walnuts on the ground throughout the fall months. You might think that the stains they made on our hands and everything they touched would have been enough of a deterrent to not pick them up, but we couldn’t help ourselves. That is, until somebody got hurt. I seem to remember Mr. Gove giving us a heartfelt talk eventually about the possibility of taking out a car window or someone’s eye, when he heard the tears. We refrained from even picking them up from that point on because we knew all this would eventually get back to our parents if we kept it up. There were lots of kids that lived on Church and High Street in the early 70s. 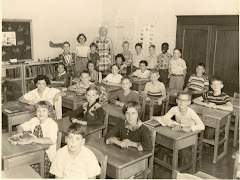 Many of these kids were the sons and daughters of renters of modest means. When I return to Warwick on occasion I am struck by the contrasts between how run down the village was back then when I lived “in town” and how it is seemingly brimming with prosperity these days. The prosperity has meant fewer kids in-town running around unattended by adults. People had less fears back then than they have today; I don’t remember any adults ever discussing the possibility of strangers preying on their children in our little town. Everyone seemed to know everyone, and that provided a comfort level that rarely exists today, or was I just naïve? When we weren’t making “snow forts” and sledding during the winter, we jumped at the chance to shovel people’s sidewalks for a couple of bucks. A dollar and half or two bucks was the going rate. I could always depend on old Fred Horton who lived on High Street a few doors down from us to let me do his front walk and path down to his back porch where he was almost always fixing lawnmowers and bicycles during the warm weather months. Mr. Horton was in his eighties then and drove this old baby blue Ford Falcon station wagon about 20 miles an hour, and he was always tinkering with it. It was an eyesore. The car was severely rusted but one day I watched in amazement as he cut up pieces of old bicycle inner tubes into square patches and glued them over the rust to conceal the car’s flaws. Then he painted the whole thing with a can of baby blue oil paint using a brush. The paint was a couple of shades off from the car’s original color accentuating, in my estimation, the damage even more but he seemed pleased with his own handiwork. Mr. Horton was always sharing his schemes and conspiracy theories with the kids on the block who would listen to him, and many of us gravitated to his back porch where we could admire his selection of used three and five speeds, and, perhaps, a coveted ten-speed or two that he offered up for low prices. All us kids were fascinated with anything mechanical, but I remember us taking a lot more apart than we put together or fixed. Mr. Horton's bikes were in top working order but they all had a grittiness about them which I attribute to the generous doses of oil Mr. Horton administered to just about everything. I had little temptation for the bikes myself, for I had a new green, three-speed Western Flyer at the time, which had replaced an earlier Schwinn Stingray; my sister had inherited that. I came for the conversation. I did call on Mr. Horton to help me with bent spokes and a flat tire or two, which he fixed for a nominal fee. My dad never seemed to have time for such things. Many of the other kids on the block learned to fix their own bikes because any contact with this old man meant sacrificing a huge block of time trying to think of ways to politely exit and an earful of his latest doings punctuated with language we wouldn’t dare to repeat to other adults. All the cussing was habitually interrupted by a pucker on his face and a stream of tobacco infused spit shooting across your feet and hitting some mark on the porch floor. The old man took an interest in me though and answered my inquiries about the way life used to be when he was young, which would have been the end of the nineteenth century. I remember him telling me that he was born in 1888, which must have made an impression on me because I remember that date. It was probably akin to a hundred years ago at the time in my mind. My interest in history was blossoming, and anything old was an obsession. I spent much time rooting through attics, cellars, and long abandoned dumps around Forester and High street"excavating" bits and pieces of the past that we kids eventually coined "good junk." I still hang on to some of my treasures from that time. Answer my questions about the past Mr.Horton did, but there always seemed to be some hidden agenda on his part. A number of times he would rope me into some type of barter agreement, “you shovel my sidewalk this winter, and I will give you that fishing pole and reel.” That’s just how one agreement went exactly, and I remember shoveling an awful lot of snow for a rusty rod and reel until one overnight snowfall that seemingly crippled the village in the waking hours of a Saturday morning. The kid next door and I were inseparable at this time, and we planned to make tons of money shoveling sidewalks as soon as we met up that morning. We walked downtown, and even got a few businesses to let us shovel their walks. Ending up at Akins by noon, after shoveling a sidewalk down on West Street, we decided to collect our just rewards for all the hard work. It seems a bit odd now, but the reason for doing all that work was to be able to afford as many vanilla milkshakes as we could drink at Akins’ soda fountain. The shakes simply weren’t that good at Opper’s, and besides having the best tasting shakes Akins gave you the entire contents of the stainless steel container it was mixed in all for 60 cents. I would guess that we got through at least two shakes a piece while we spun around on the counter stools and checked out the large display case of Matchbox cars I remember being nearby. On our way home we passed Mr. Horton’s, and his sidewalk had been shoveled by this time. I had wrongly put off doing it until after I sought out what other shoveling jobs I could get for money. I didn’t think much at the time about the fact that Mr. Horton either did it himself or got someone else to do what I had promised to do. I rationalized that I had merely put it off for later, but later had amounted to a couple of hours. Mr. Horton rarely went anyplace, but that particular day he had somewhere to go. He had to do the shoveling himself, and when I learned that, I felt bad about it. He caught me on the street the next day and brought me into his house where he rebuked me for reneging on our agreement; he said the deal was off. He never mentioned the fishing pole again, nor did he ever address the fact that I had shoveled his walk for most of the winter without compensation. One would suppose that I learned a valuable life altering lesson about responsibility, but, honestly, the lesson learned was just not to get inveigled into any more bartering; I was simply a C.O.D. man from that point on. I probably wouldn’t remember this story, if it wasn’t for the 1773 Colonial Half Penny I still have from that time. The money that I had made that day shoveling snow, minus the cost of some milkshakes, had been saved for a rainy day. During the following summer, one of my uncles could often be seen metal detecting for old coins on the church green; this was before a lot of people who were responsible for some historic sites wised up to the fact that these guys were making off with a lot of valuable historical information that could just as easily be retrieved by an archaeologist for the sake of scholarship. 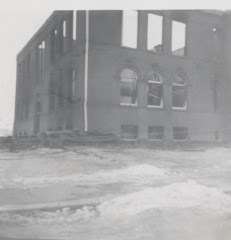 At the time the treasure hunting was all I could think of, and I would tag along as my uncle made swathes up and down the hill in front of the Old School Baptist Church where we not only sledded in the winter but played ball games in warm weather. 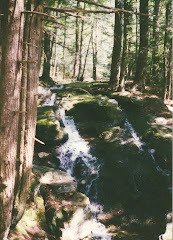 His rationale for searching the hillside was rooted in the fact of our contemporary play. He reckoned that kids a hundred or more years ago would have played just like us and lost their change as they rolled, frolicked, and fell on the incline. Other places like the site of the first Hamilton Avenue School, beyond the visible outline of its former foundation, weren’t as fruitful as the church green, for that first Hamilton Avenue had burned in a great fire and the ground around it was lousy with rusted nails just below the surface. Those nails meant a lot of work for nothing. The church green was his Eldorado. After a few times of making a nuisance of myself by following him and asking too many questions, he set me to work with a second older metal detector he had so that I could search too. I will never forget that on the first occasion he hooked me up with earphones and sent me on my way I found an 1838 penny. What was especially remarkable was that he had never found a coin as early as that up to that point, or, at least, that’s how I remember it. 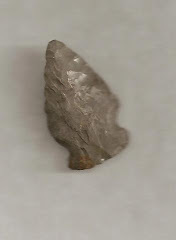 That and a few mercury head dimes were my great finds of the day, but I also remember much of the time was spent digging up tin foil and bottle caps. 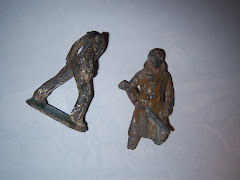 I was especially intrigued by pieces of old toys and the like, for I was actively collecting cast iron toys at this time. He let me keep that junk while he made me fork over the coins I found. It seems that my uncle’s frequent activity on the green attracted others with metal detectors who would show up on the weekends that he didn’t. I would follow them around too. On one occasion there was this kid from my class presumably accompanied by his father who was doing the metal detecting. My father was around that day too, and he knew the father of this kid. At some point the kid knocked at our door and asked whether we might be interested in what they had found on the church green. My father asked him what he had found, and the kid gestured that he would be right back with the answer. He ran to the man on the hill with the metal detector who raised his hand to us and reached into his pocket and emptied it in the kid’s hand. We watched all this from the front door of our house. The kid returned with a handful of dirty coins. 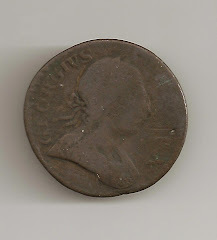 He pointed out the 1773 Colonial Half-Penny that he claimed they had found that day. He wanted five dollars for it, so I got the five dollars I had earned snow shoveling, and I paid him for the coin. Although I believed at the time that the coin was found there on the green, I am not so sure now. At the time my believe had been validated by my uncle who believed it was authentic after closely examining it; he was actually a bit put out that he hadn’t found it himself. I remember he referred to a reference book that he always kept with him, and there was a better version of the same coin in black and white in that book.The fact that the church on the hill was built in 1810 and not in the colonial period cast no doubt on the coin’s provenance at the time, but then again I was only 10 or 11. The first thing to consider is that this coin was likely in circulation in Warwick before and during the American Revolution. Another circumstance of these types of copper coins was that they were frequently forged. Some claim that 60 percent of the small change in circulation during this period was counterfeit. One characteristic of a forgery was that the legend was altered to protect a forger from a mandatory death penalty if caught. For example, by altering the GEORGIVS-III-REX legend to something like BRVRVS SEXTVS a forger might claim that this was not meant to be a forgery but a token issued for some other purpose. My coin has no such deviation from the standard. By 1775 there was no minting of currency, and this condition lasted until 1797, so many coins that had been minted before 1775 were in circulation for a very long time. The lack of small change forced businesses, cities, counties, and the like to issue their own tokens in lieu of formal coinage (Hume 162-63). 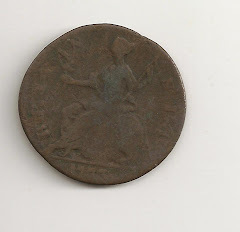 The fact that George the Third is unrecognizable on this coin is evidence of wear sustained above ground during the several decades it was probably rattling around in the coin purses of virtually all the Warwick residents of that time at one time or another and not any alterations occurring during its nearly two hundred years of burial on the church green. Then there is the issue of where the coin was supposedly found. The church as previously stated wasn’t built until 1810, so could a coin that predates the republic itself been lost on a site that had undergone the upheavals of a major construction like the church? Why not? 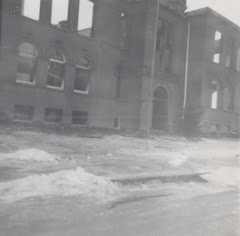 I have never come across information that there was a prior building on the site now occupied by the Old School Baptist Church (correct me if I am wrong). The footprint of the church was likely leveled off to a degree, but as far as I know the foundation of the structure, other than several courses of stone below ground that serve as footings to a foundation that is shallow and above ground, the construction of the church didn’t alter an existing topography much. Although the site of the church was likely not altered much for the church’s construction, everything beyond the cement wall that for a long time has marked the church property in front was transformed. Many of the houses on both Church and High (which was previously called "Front Street") were built after the church. 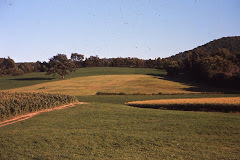 The topography from the banks of the Waywayanda Creek to the top of the church green eventually underwent some major transformations after 1810. These were amazing if we consider that the removal of such large amounts of earth from a natural and steep grade on both sides of the church had been removed by hand, horse, and oxen and sculpted into the level village streets, High and Church. The greatest evidence of the steep hill that once stretched to the Waywayanda is that most of the houses between numbers 18 through 24 on High Street all have backyards that are some fifteen feet plus below street level. The foundations of these houses were all built after a significant amount of earth was removed that once was part a natural slope down to the banks of the Creek, so these houses were essentially constructed out of a hollow made in a hillside. They were not built until after 1875 because the property had only one dwelling, the home of G.Burt, that sat back from Front Street. The property was essentially an open field. There was a house to the left of this property owned by F.Gurling, and this was right on Front Street. This maybe the house that was inhabited by the McCombs and the Hortons in the 1970s. The property to the right was that of the Warwick Institute. The 1875 Map of the Village does not include dwellings that existed right on the Waywayanda. There were stone foundations to two, if not three, buildings down at the water's edge, and these likely dated to before the turn-of-the-century because of the mortarless and manicured stone blocks that their foundations consisted of. 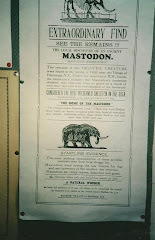 They must of appeared after 1875, or they were ignored on the village map. These I dug around and screened for artifacts in the early 1970s finding many clay marbles and one badly marred sulphide marble with a horse figure inside. I don't recall any charred remains which would rule out their destruction by fire, so they may have been torn down long ago by 1973-4. These foundations were below a wood frame house that had long been abandoned and was owned by Mike Myrow who had it bulldozed shortly after a bunch of us neighborhood kids started exploring it. Apparently, the building had been inhabited by a local junk dealer named "Pee Wee Jenkins" at one time, but that may only be a story I was told as a kid. There was a late 19th century telephone mounted on one of the walls in the house that sadly got plowed under because I hadn't devised a way to get to it across the collapsed second floor. The house and the wooded area around it were a popular destination for us neighborhood kids. There were fragments of a 1920s Ford, an old safe without its door, and a 1942 Buick on the property that made for some great make-believe scenarios. The Buick had long ago been stripped of its head leaving a bare and hollowengine block , but the chassis was complete with doors, a dash board with a speedometer, and a steering wheel. 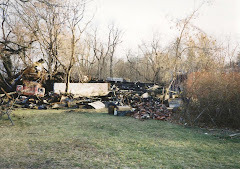 Shortly after the house came down all the metal debris and cars was cut up and carted away. I had salvaged some parts from the Buick including the windshield wiper mechanism and some pitted chrome hardware that sat on the floor in my room for quite awhile until it mysteriously disappeared one trash day. The footprint of the former Miller and Stockton Lumber Yard was likely created by fill that came from the excavations of the above sloping hill by the turn of the century, when this particular stretch of Front Street houses had been constructed. Each of these houses had a footprint including their backyard of under .25 of an acre. The buildings of the lumber yard closed in the gap between these properties and the banks of the Creek.There was probably earlier shifts of earth with the construction of the earlier homes on the east end of Front Street like the J.D. Pitts house and others, and these earth shifts also added to the site where the lumber yard eventually stood. The natural incline is revealed when entering South Street from either Main or High Street today. This is likely how steep the grade ran from what is now Smith Street up to the heights of the Old School Baptist Church. One could probably view the Creek from the steps of the church when it was built if the trees had been felled for farmland. Finally, the slope in front of the church is likely the remainder of the natural one that ran to the Creek long before any European set foot in the Warwick Valley, and decades before the church was built someone may have lost a well-worn Half Penny in the grass on the hill. 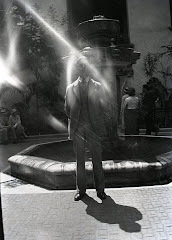 Hume, Ivor Noel. A Guide to Artifacts of Colonial America. New York: Alfred A. Knopf, Inc., 1970. What I remember most about Museum Village in Monroe, New York are the early “traction engines” parked side by side in open front storage sheds. There were names, now unfamiliar to most like Russell, Rumely OilPull, and Nichols and Shepherd, emblazoned across their bodies, or that is what I recall some thirty plus years ago. 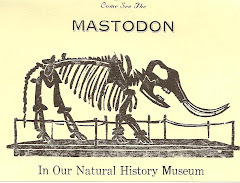 That memory was probably from my first museum visit, or, at least, it is my earliest memory of visiting a museum. 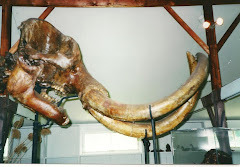 I also remember the disappointment of not being allowed to climb on those metal mammoths as we all wished to on that autumn day in 1971 when my Park Avenue Elementary School class went on a field trip. The museum had fastened livestock wire fencing across the front of the shed as a deterrent against kids prone to climbing like ourselves. These machines must have been even more impressive when they were new in the late 19th century and early 20th, but my guess now is that these museum pieces never saw much action in the surrounding dairy country I grew up in Warwick and its environs. These tractors were likely collected from places where crop production was on a far greater scale than the relatively small dairies of Orange County. The shear weight of these monsters would have insured that any local farmers would have spent a lot of time knee deep in mud trying to get them unstuck from the small divisions of stone walled pastures and fields that characterized local farms in these tractors’ heyday. 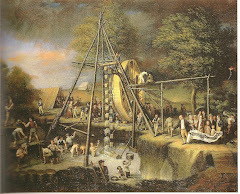 These babies were meant to travel in long, level, and unimpeded swaths of farmland or to work with the use of a belt to thresh and grind far greater multiples of what any local farmer required for his dairy herd of thirty or forty at the most. The largest farms around like the commercial Borden’s establishment that used to stand in all its grandiosity off the road to Goshen, and since razed to the ground, wouldn’t have used such equipment either, for with the huge number of cows to milk there were always laborers available for field work on their hundreds of rolling and rocky acres using horse or oxen and plow. The rocks and hills characteristic of that Borden farm and much of the Warwick Valley would have been dangerous terrain for these rigid power houses, and even the modern tractors of later eras were known to turn over at the urgings of rock, tree root, or mud. 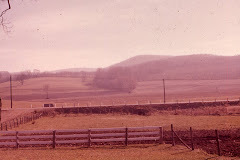 I recall the story that my own grandfather’s farm on Rt.94 was the scene of just such a tragic death when one of his narrow stance Farmalls flipped completely over crushing the inexperienced teen who had taken it out without permission and tried to do donuts in a field in the 1950s. After the First World War, it was the smaller gas powered tractors of makers like Samson, International Harvester, Ford, Case, and John Deere, to name a few, that were among the popular choices for those who could afford to mechanize for the needs of their relatively small dairies in comparison with the great crop farms of the West that required combines and the like. 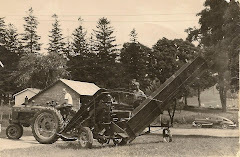 Many small farms in the Warwick, NY area stuck to seemingly more reliable draft horses and oxen for pulling their machinery and doing the field work that needed to be done right up to the Second World War. The cost of tractors was likely a factor. 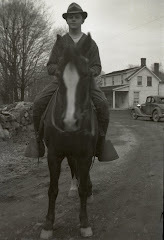 My own maternal grandfather, Paul Miller, who first started his own farm business with the help of his father-in-law Phillip Kiel in Little York, made use of work horses in his first year of solo farming in 1936-7. The agreement was that he could make use of Phillip Kiel’s farm to get on his feet building a herd of milking livestock before he set out on his own. 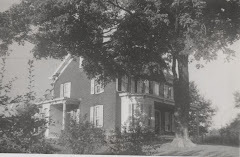 After a year he rented the Lawrence farm (Sanford Farm) in Warwick, and he remained there until he bought Fair Meade Farm on Rt.94 in 1947 just a stones throw from the farm his father, Peter Miller, rented and raised his thirteen children on including Paul himself, the oldest. As far as I can tell he was using draft horses right up until 1940 when tractors started inhabiting the photographs that document his early dairy operation. 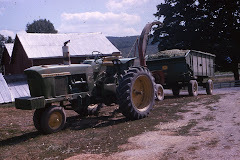 The transition to tractors occurred soon in his farming career, and there was an early preference for machines produced by International Harvesters. A narrow stance Model H lasted for many years on the farm, and that could have been bought as early as 1939. There was also a Farmall C, and that was only produced from 1948-1951. The best of the lot was the Farmall Super M which was likely purchased in the early 50s, and that saw lots of wear as a circa 1963 photo evidences. It is likely that the C and Super M were bought new somewhere in that time frame. I can recall going to the International Harvester dealership in Edenville as a child in tow with the adults. 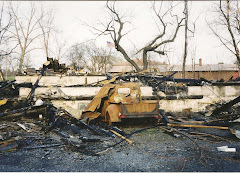 What I recall most about those visits was wandering to the back of the building to get a look at the old hook and ladder fire truck that was parked in the field behind surrounded by tall grass. 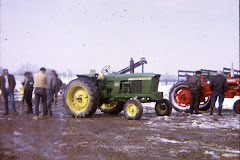 By the end of his short life of fifty one years, my grandfather had purchased some state-of-the-art John Deere tractors. Most notable of these was a narrow stance 4010 Diesel that was touted as one of a “New Generation of Power.” Power it had with its 80 horsepower four cylinder; it could pull a five bottom plow with little effort. This model featured innovations like a synchro transmission that allowed you to shift without clutching while doing field work, and for the first time you could maintain a momentum while plowing, disking, and other tasks that would otherwise be interrupted with the reduced RPMs resulting from clutching and shifting. When you think about the relatively short time frame of a little more than two decades of farming Paul Miller had made a momentous leap from doing field work with horses to such a tractor. I believe that my grandfather was quite proud of owning such a machine as is evidenced by the photo documentation of it shortly before his death in 1964, and rightly so; it was a beauty. A love for tractors was passed on to me, and no doubt my cousin Paul too, although it is a safe bet that I will never own anything bigger that a riding lawnmower or a rototiller. I think much of this love is a result of my time growing up on the family farm, or the fact that my grandmother bought identical Ertl John Deere pedal tractors for both my cousin and I when we were still toddlers placing them in our play pens long before we knew what to do with them. My son shares this love of tractors, with trains a close runner up. This was in no way encouraged, but I have to admit that I enjoy his toy tractors as much as he does and don’t pass on any opportunity to buy yet another one. When he was beginning to acquire language and share it with my wife and I we were struck by his unsolicited responses to the tractors and heavy equipment that we passed in the car on our travels. We did buy him some books about tractors, but it was he that gravitated towards them often ignoring all else. One of my son’s early favorites was a comprehensive history of tractors that I picked up at a sale for dollars. It is essentially a research book with stats for an adult, but it has some great photo-documentation of tractors in it. This was obviously the book's appeal to him. It was bigger than him then, but a routine developed before sleep each night when he would sit up in bed and turn the pages of this enormous hardcover proclaiming a “trac-tor” on each and every page while nodding his head and seeking my affirmation. 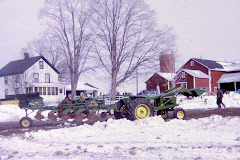 The toys I remember the most from my childhood were the miniature tractors and implements my cousin and I ( we were months apart in age) got at the John Deere dealership Gor-Duns in Goshen when it was necessary for the adults to buy parts for the larger versions. My cousin still reminds me that although we shared toys it was me who inevitably broke his first and then broke my own. The Ertl toys had a greater resistance to my destructiveness, and they seemed to fare better than the plastic toys. The tradition of owning Ertl toys is preserved to this day in my family because of a nearby John Deere dealership in Ellsworth, ME. We frequently buy the virtually unaltered metal toy tractors and attachments for my son. He has far more toys in general than I ever remember having. My own tractors never survived the farm; they mysteriously disappeared shortly before we moved from the farm into the Village of Warwick. It was likely that the adults made them disappear to ease our “cold turkey” move from the farm that I had always known as my home and my cousins who had always been with me every waking hour. 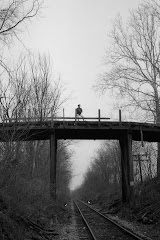 Life would be very different in a rented apartment above a house on Forester Avenue in the village, but I would eventually stake a territory out for myself in the still numerous wooded areas around Memorial Park, Park Lane, and along the Waywayanda Creek. At the Blue Hill Fair (ME) two years ago (the place where the fictional pig Wilbur wins a blue ribbon in E.B. White’s Charlotte’s Web), my wife and I picked up an almost identical pedal tractor to the one I once had as a child. The difference was that this was an Allis Chalmers in color and in choice of decals. It would undoubtedly serve just as well as my John Deere did for rough boy play. 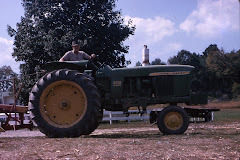 The John Deere model offered at the fair seemed cheaper in construction than the cast metal of the Allis Chalmers with its narrow stance steel and rubber wheels exactly like my own from over 40 years ago. Gabe, at four and a half years, has only just reached the pedals. He still strains to get it to go anywhere on our gravel driveway, but he has found every imaginable combination of accessorizing the tractor by means of a piece of clothesline or shoestring. I have seen a tricycle, plastic cart, eight foot two by fours and the like trailing behind that flashy orange tractor as he walks and pushes when he can’t pedal . During our routine Sunday drives as a child, I would scan the countryside for old tractors and cars alike parked behind barns and overgrown with weeds in fields. One of the earliest tractor dinosaurs in situ I remember seeing was in Bellvale at the Benedict Farm. As many of you who grew up during the time frame of the 60s and 70s in the Warwick area might remember, the Benedict Farm was literally polluted with wrecked cars and machinery from all eras. Pasture and hayfields alike were lousy with decrepit autos that had doors and hoods left ajar and trucks in various degrees of disassembly, damage, and decay. 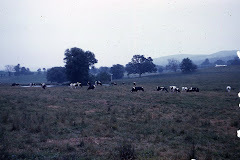 My cousin and I once tagged along with my uncle Bob on a visit to the Benedict dairy on that rare Saturday when we were together , for he had also moved away from the farm by this point to as far away as Greenwood Lake. I can still picture us sitting in the back of the pickup on the way there fighting the summer breezes with our arms and hands down Kings Highway and then onto Iron Forge Road. 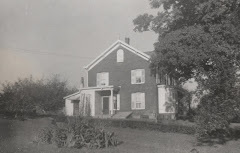 I have seen pictures of the Benedict farm house and outbuildings from the 19th century since that early experience. It had been a showplace rivaling all others in the area under the ownership of earlier Benedicts. I recall that it was Italianate in style, a villa of sorts a gem among the monotonous white clapboard farmhouses that dotted the valley. It had the characteristic stucco plastered over wood on its exterior, but much of that had been shed by this later chapter in its history. Efferd Benedict, then its owner, seemed of a more relaxed persuasion than his ancestors, for I recall not only the disrepair of the house and outbuildings, the dozens of decrepit vehicles, and the debris scattered about with no regard for appearances, but his choice of some old and battered rocking chairs right in the middle of the cow barn, between the rows of stanchions, where he sat rocking and presiding over his domain. While the adults talked it up on that particular visit, my cousin Paul and I beat a path through the eye high grass behind the barn to explore the countless wrecks . 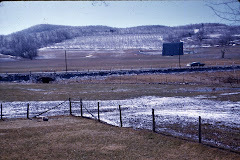 I took notice of the rusty Fordson that day once we had worked our way from the back barnyard to the front where there were well worn paths with deep tractor tire ruts. 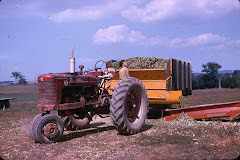 This must have been sometime around 1973 or 1974, so the use of that Fordson on that or any farm had been for a longtime a distant memory. The tractor set in plain view surrounded by burdock and the like. It was steel-wheeled and rubber less, which made it stand out at this point in time. That was how it came in the 1920s; there were rubber-less tractors being produced into the late 30s. The Fordson had been of relatively low cost to farmers seeking mechanized horsepower. For $750 a shiny new version could be had in 1918, and by 1922 Ford’s “price cutting policy” brought the price down to $395. The condition of this Fordson evidenced that someone had gotten their money’s worth many times over. There were still residuals of this 18 horsepower, four cylinder’s original gray paint, but, clearly, this thing hadn’t coughed up smoke in a long time. The three speeds once made possible by the gearbox had long since seized. One of the desirable design features of this model was the way the engine housing, transmission, and differential were all joined firmly together eliminating the need for a separate frame. It protected the innards of this little engine that could from fouling with dirt from the field. 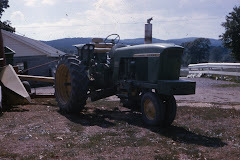 That tractor remained there for many years, and I would always admire it in passing wishing that one day I could buy it and resurrect it. This was undoubtedly an idea born of watching Chitty Chitty Bang Bang too many times. It disappeared eventually with Efferd Benedict and the farm itself. All those cars and machinery were no doubt hauled away for scrap after his passing. I have occasionally seen a Fordson since then; some of them were still serving farmers in places like Finland and Russia as recently as the end of the twentieth century. I remember seeing one on a fifteen hour bus trip from Vasa, Finland to what was then Leningrad in 1984. Apparently, they were first exported in great numbers to places like this, for, unlike the United States, there were few competitors to satisfy the need for agricultural mechanization. Fordson was increasingly replaced by more powerful models and affordable choices here in the US, so the company attracted distributors like Armand Hammer who sought out foreign markets for the trusty little tractor. The newly formed Soviet Union was highly receptive to the Fordson seeing it as key to an anticipated future agricultural prowess. 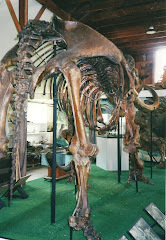 Recently, I had another chance to examine one of these little work horses at Henry Wiswell’s farm in Orrington, Maine. Henry Wiswell took my son Gabe and I on a tour of his family farm showing us some of the equipment acquired and kept by the eight generations of Wiswells that have lived on the farm since 1789; the Wiswells moved to Orrington in 1772 from Massachusetts. Most amazing was the Model B John Deere with narrow stance front wheels that Henry’s father had bought new in 1945 for 800 dollars. It still runs, but “it needs a coat of paint,” which “it will get this Spring,” according to Mr. Wiswell. 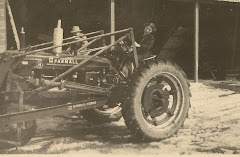 Although this wasn’t the first tractor owned by the Wiswells, it was one of the first, and the fact that many such possessions have remained in the hands of their original owners in Maine sometimes puts me in awe. There is a sculptor by the name of Peter Berrit that lives and works out on Deer Isle, ME. His metal and wood sculptures are always fantastical in nature embodying the story and myth of his vivid imagination. Dragons, knights, and the anthropomorphized are realized in literally larger- than- life multimedia creations. He welds and fastens many found objects from the local garbage heap where one can often find a smorgasbord of bits and pieces of 19th and early 20th century material culture in abundance. Berrit has remarked that it is specifically Maine that is responsible for much of his ability to craft the things that he does, for the abundance of barns and outbuildings necessitated by long and snowy winters as well as less access to cheap replacements for the manufactured goods from a time when planned obsolescence wasn’t a consideration in design, allowed for things to last longer and remain on the Maine homestead even after such things had long passed from fashion elsewhere. There simply wasn’t commercial garbage removal on the scale of other places, and people didn’t throw things out. Now we see these things showing up at the local dump, and here Peter Berrit finds his raw materials. What I get, and I expect many others do too, is not only the experience of art but a exercise in deconstructing the part from the whole, and this offers us a lesson in rural American material culture. Like those bits and pieces found by Berrit for his art, the numerous rusted ancient tractors and accoutrements all over Maine serve my son and I as the stuff of dreams about what was and what could be again.